Improve accuracy of your strategic decision-making! Comprehensive knowledge is a prerequisite for accurate decision-making. It enables you to track the reasons for ongoing changes and processes. Such an awareness is also critical to forecasting the effects of actions taken. Therefore, business solutions for effective business analytics are valued highly among companies, nowadays. Business Intelligence (BI) is a process of transforming data into information, and further, into knowledge that boosts the productivity and efficiency of the organisation. BI tools can be effective only if they use high quality data warehouses. 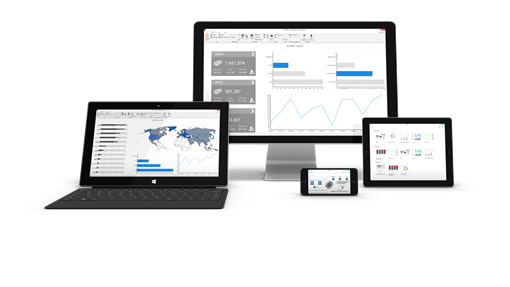 In the data warehouse, data retrieved from various systems used within one company can be standardised and linked..
Targit Decision Suite is a modern Business Intelligence solution that is fully compliant with Microsoft Dynamics NAV. When integrated with the ERP system, it can be used to create analyses, reports based on various sources and different executive dashboards. 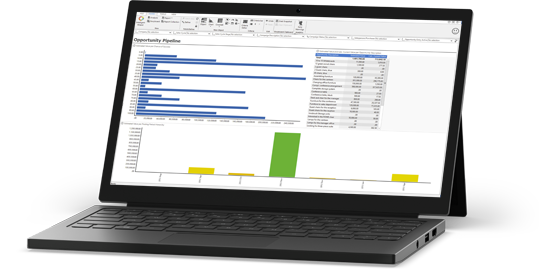 Targit Decision Suite provides critical information for accurate and effective decision-making. It supports analytics, controlling, result forecasting and risk management, using the latest improvements in in-memory processing and data warehousing. The function can be used similarly to a web browser. The user can enter any query and Targit provides a range of search results, allowing the user to select the most accurate ones. Additionally, by raking the query results based on results selected by users, the browser supports team work. Bullet Graph offers a variety of setup options. It can be applied for various data sets. 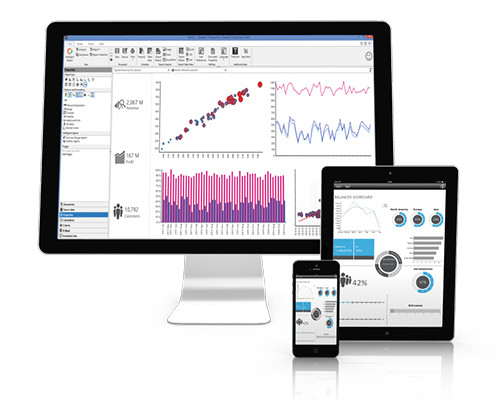 Using the Gauge Builder tool, the user can design custom gauges and develop manager dashboards. Targit enables the user to access views from many data sources and provides an enhanced calculation engine. With their hierarchical structure, multi-dimensional data analyses provide the user with comprehensive results which can be viewed on various detail levels. The user can group such results, select exceptions with nothing more than just a click of the mouse, as well as track relations and generate reliable reports. 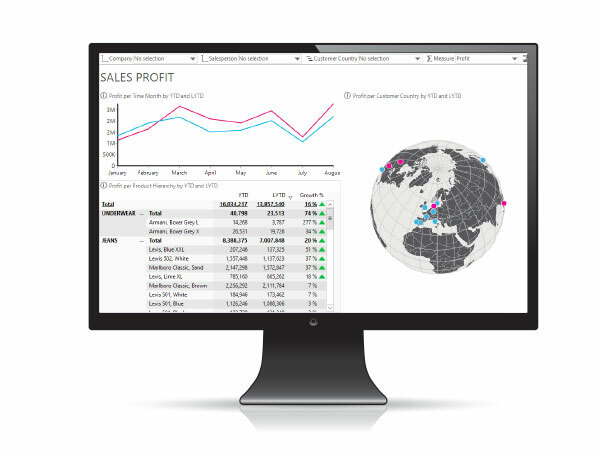 Targit enables you to project trends based on static and dynamic factors (e g. values of revenues and costs) and visualises the projected results. If any actions related to implemented changes are needed or should be ceased, the agent notification function informs all users involved. 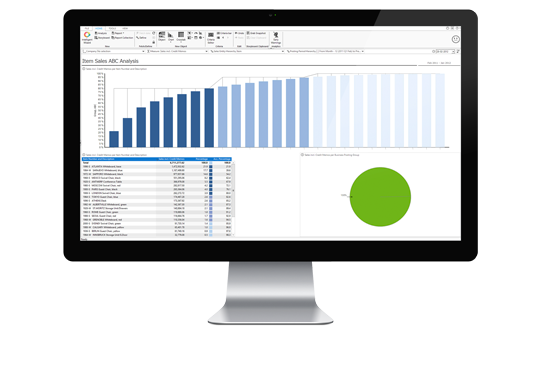 Targit also supports the creation of key performance indicators for selected parameters within the system. Indicators can be combined at manager dashboards, which enables the user to evaluate its key business processes (such as the application of revenues and costs). Process automation supports executives in accurate decision-making. 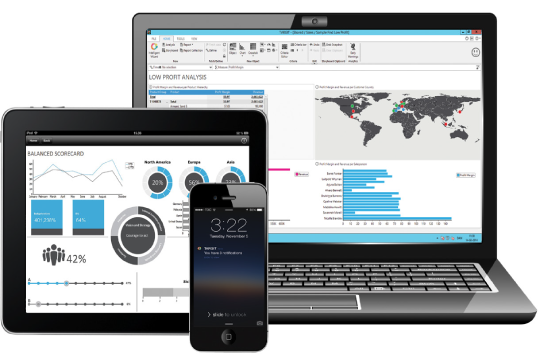 Improved planning is one of the fundamental benefits of Business Intelligence tools. Targit provides precise information on assigned tasks to selected users. You just prepare the content, select addresses and schedule and Targit sends the appropriate report automatically. The enhanced functionality enables the user to create specific reports for selected groups of recipients and products. With just a few clicks, you can create a presentation by selecting the analysis view, and then its layout and format. Based on your selection, Targit creates a video, webcast or presentation. You can also create a dynamic presentation to view current data bases. This functionality is particularly useful for creating the content for websites, video advertising and and information boards. The wizard enables you to switch databases used for Targit easily by defining a new connection. Special accelerators enable the user to speed up the process of building Microsoft Dynamics NAV based models and warehouses. Accurate understanding and interpretation of analysed phenomena. Easier and more efficient sharing of data among team members. Optimised actions and controlled business targets. Before Targit was implemented, we used to wait until the analyst prepares a report several hours and even the whole day. Additionally, particularly with new reports, employees who requested for analyses did not know exactly what they wanted. When a new report is created, some experimenting is always necessary. Only when the requesting person receives a data set, is he/she able to notice that some data distort the results and some adjustment is needed. Previously, it was also the analyst who adjusted the report, so more time was required to prepare a final report. Targit offers unlimited experimenting capabilities for analysis results. It is due to the fact that it is no longer the analysts but all users who generate the report. Needless to say, reports are created only within 2-4 seconds. Therefore, it is possible to trace the results of changes made in real time. Earlier, as much as an hour was required. Przemysław Madejski, Chief Operating Officer in Cross Poland Sp. z o. o.
Click and check how much do they cost!